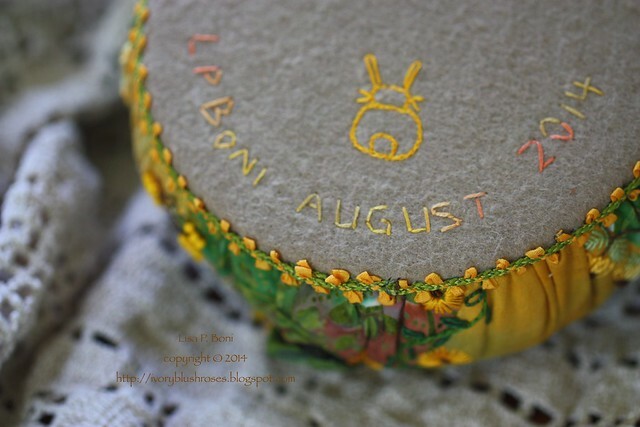 Though it's the end of September, I've just finished the August Pincushion for the CQJP (Crazy Quilt Journal Project) 2014. 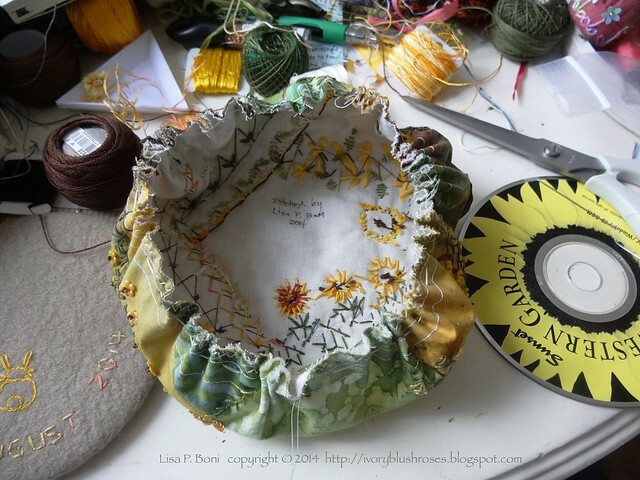 I've known for a while that I wanted to do a pincushion with sunflowers and since they are at peak bloom here in August, it seemed the perfect pincushion to do them on. 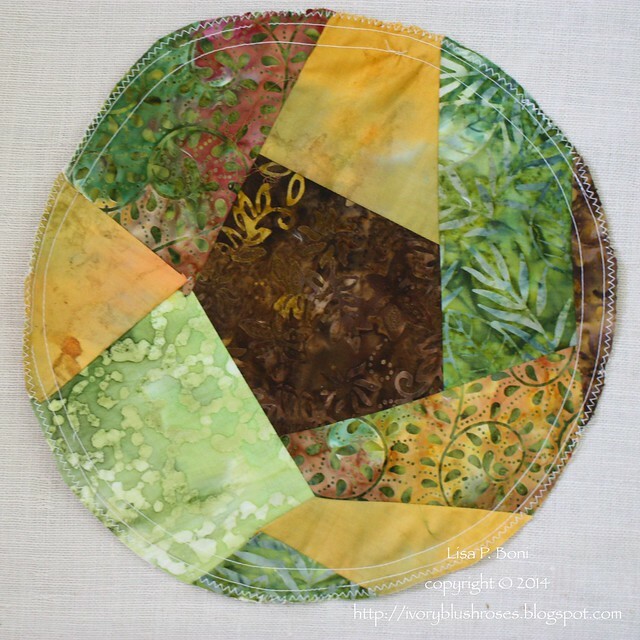 I started with this block in yellows, brown and greens. The colors I think of when I think of the end of summer here in Colorado. Though I have to admit that this year it was greener than I've seen in years due to our slightly cooler, damper than usual weather! For those who want to know, I make the circles for my pincushions 9" in diameter. 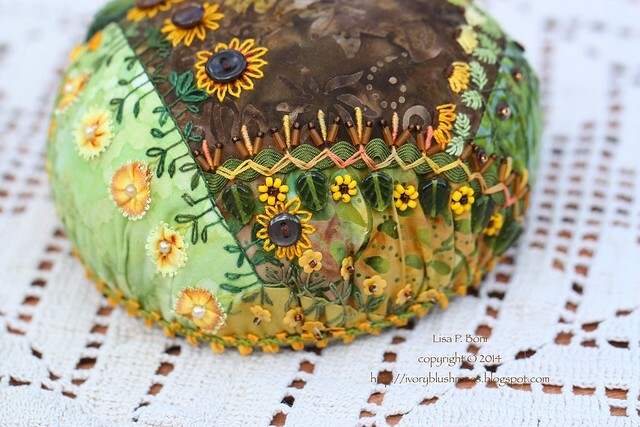 The outer inch to inch and a quarter will get hidden when the pincushion is formed. I've taken to signing the back of all my work. Not that anyone is likely to see it. But I think of all those amazing antique quilts we see that no one has any idea who made them, and I think it's a shame. There's something intriguing to me about the back side of a piece of crazy quilting. It has it's own language and beautify somehow. 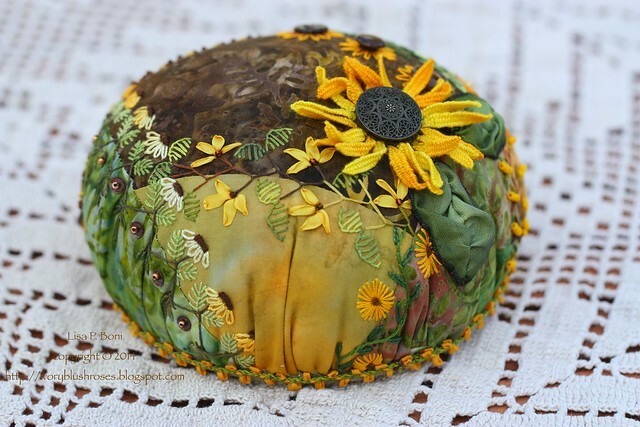 On the inside of my pincushions, I use two old CDs or DVDs, one in the top and one in the base to give it shape and stability. Every now and then, serendipity happens and I find a CD or DVD that is so appropriate to the pincushion at hand. 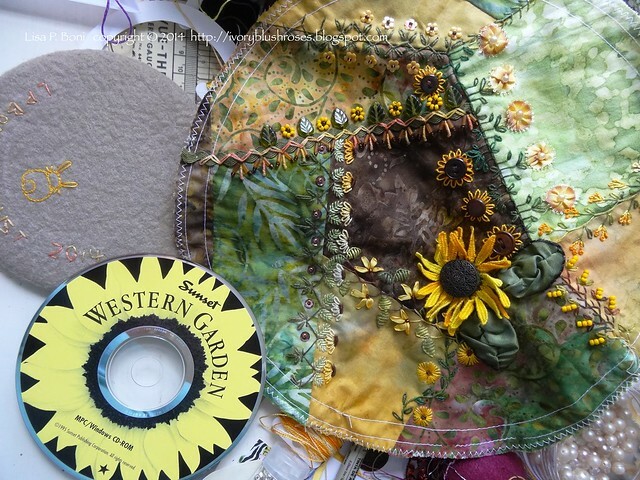 Like this old Sunset Western Garden CD with a sunflower on it! The inside of my daughter's Ring Pincushion for her wedding had an old Pride & Prejudice DVD in it, which happens to be her favorite movie! While I love the look of the blocks when they are flat, there's something about turning that flat piece into a dimensional object that I just love. And this is why I am forever cleaning cat hair off of all my work. Miss Mollie likes to sit on my lap while I'm working. Sometimes we can work together. Sometimes we can't. She has a soft nest next to my chair in which she sleeps when she can't sit on my lap. She sits like this when I'm at the computer as well, so this is definitely my most common view of her! 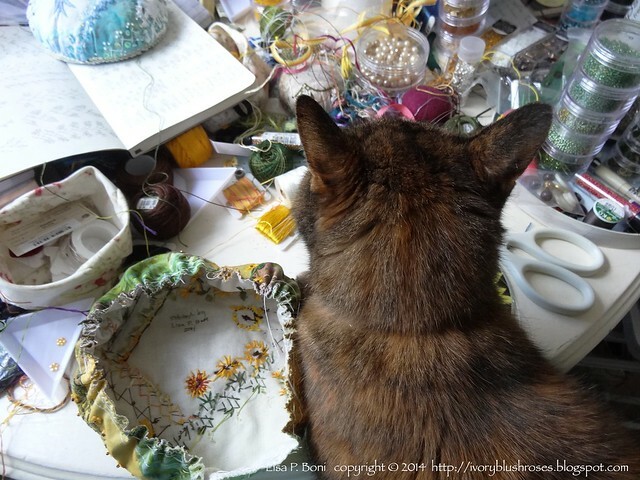 Back to the pincushion... 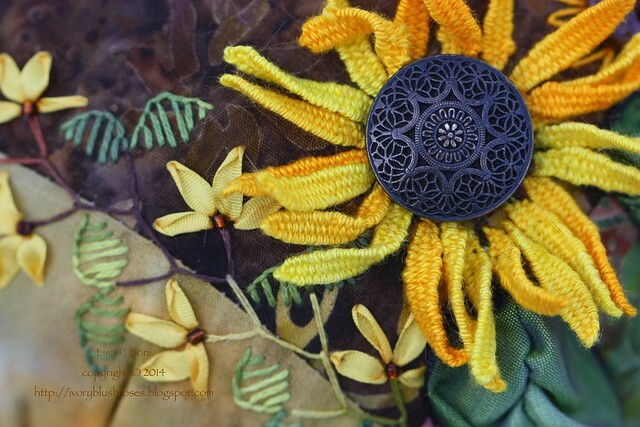 When I saw these buttons, It thought how perfect a center it would make for a sunflower. 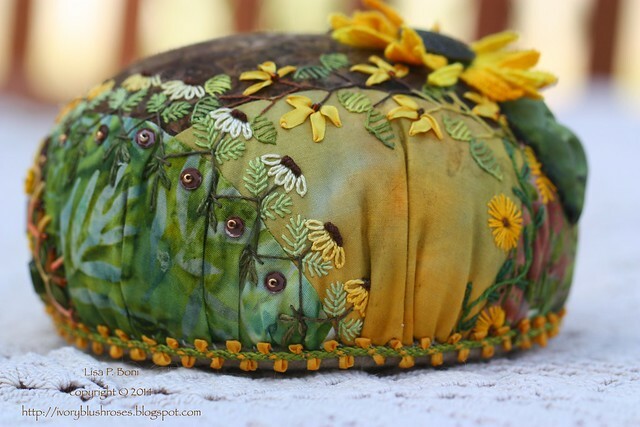 I backed it with a couple circles of felt to give it stability and stitched a wreath of woven petals to create the sunflower. 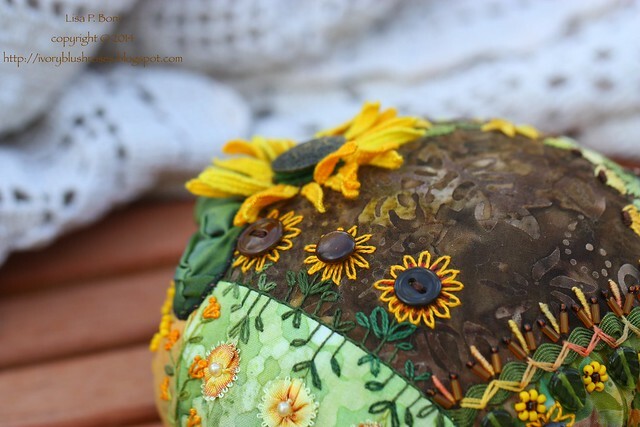 Using variegated thread gives the sunflower added interest. 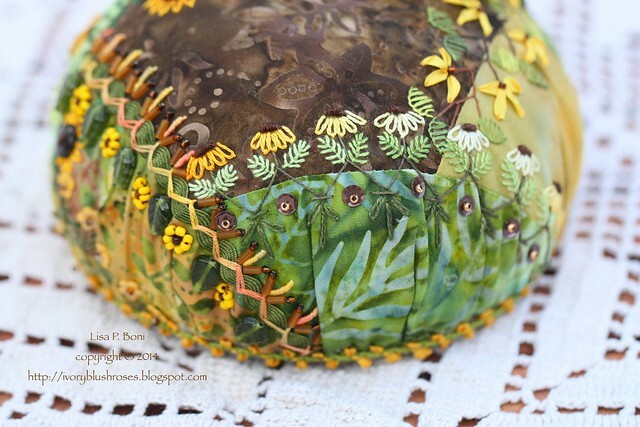 Around the base of the pincushion, I used a Mokuba ribbon trim that I purchased at Florilegium in Missouri. The colors were perfect! I love glass leaf beads, but rarely seem to actually use them on a project. It was fun to add them to this rick rack seam. Here you can also see some of the little flower sequins I have from Cartright Sequins. Some little ribbon rosette flowers from Mokuba picot edged ribbon was a nice touch. The flowers are from the same ribbon, but I varied which edge of the ribbon I gathered to change their color appearance. I love this little vine of straight stitch flowers. 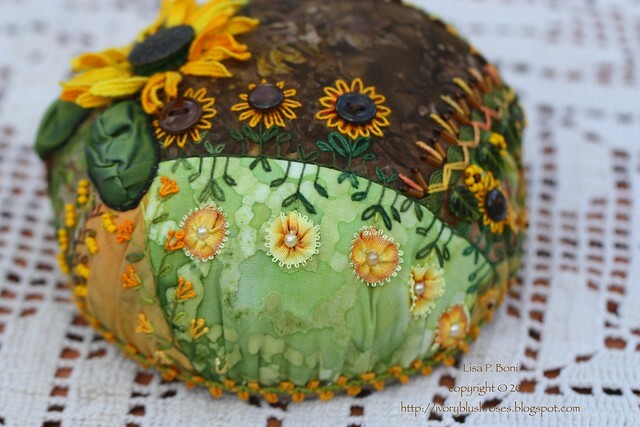 This also gives a good look at the ribbon leaves I added for the big sunflower. Some small brown buttons became centers for a row of sunflowers. Now that I've finally figured out how to do bullion stitch and how to make it come out consistently the way I want it too, I've been using a lot more. 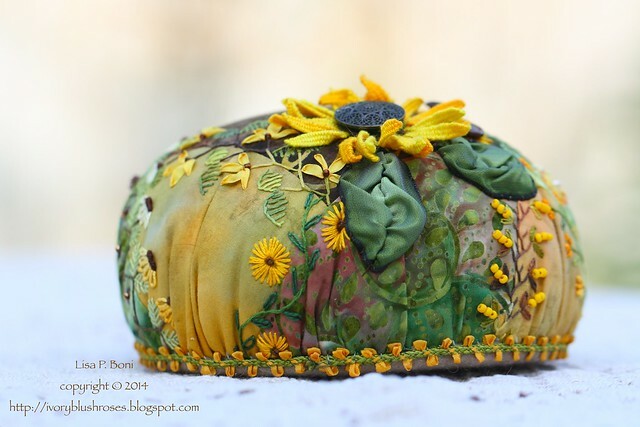 Here the bullion stitch buds tuck among some golden bugle beads for a stylized flower. 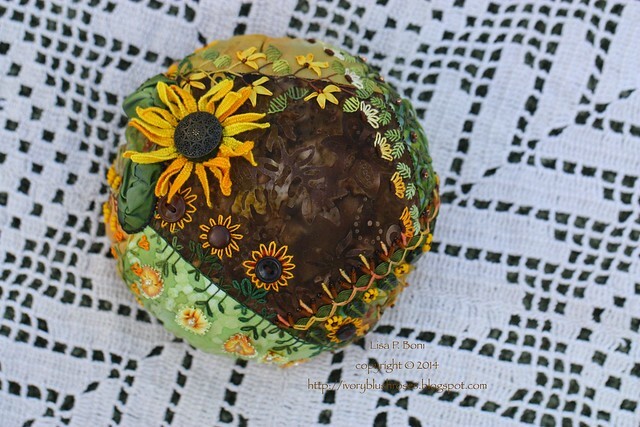 I also used bullion stitch to make the centers of these sunflowers. These are my two favorite seams on the pincushion. Love the way they turned out! It's just such a happy pincushion! 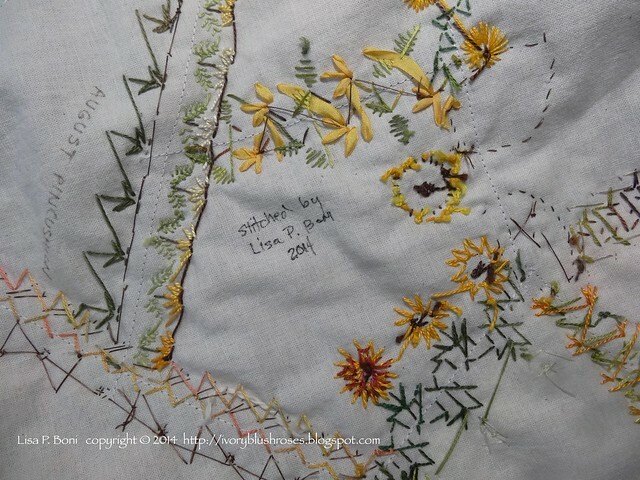 On the back, I added my usual signature along with the month this pincushion represents. A view from the top! 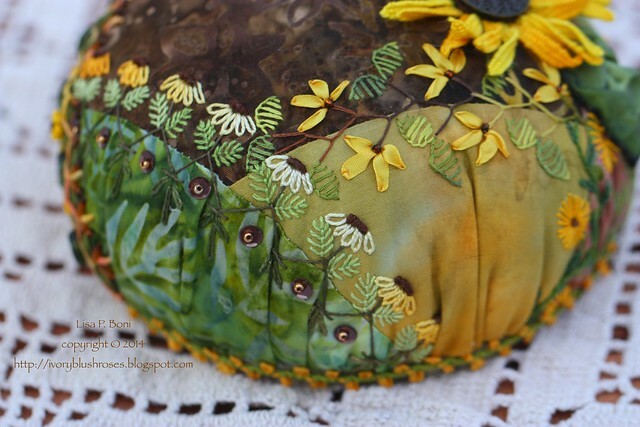 Like I think I've said about each pincushion before it, I think this one is my new favorite! 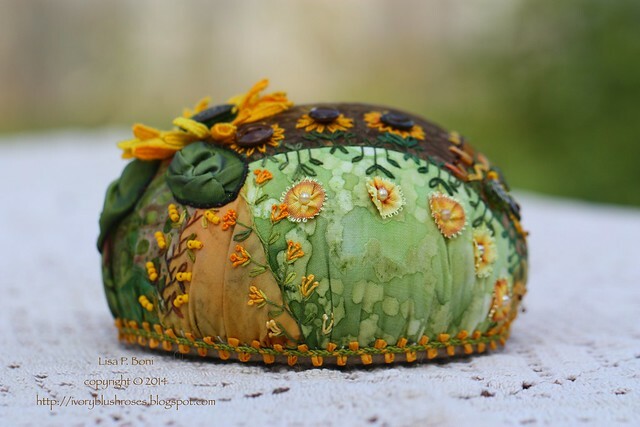 All of your pincushions are just beautiful!! I think this is my favourite too. Of course I think that about every new one you do, so I'm prepared (when the next one comes up on your blog) to be fickle once again and love it best. Simply gorgeous! Live the colors, the stitching and the flow of the entire piece! So wonderously beautiful!! You captured the lovely feel of August perfectly! 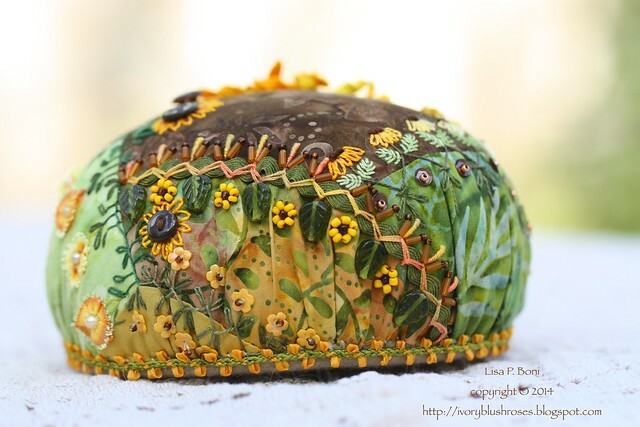 Your pincushion turned out lovely! Dear Lisa ~ This is wonderful and so end of summer beautiful! Your work inspires me while at the same time makes me feel like such a beginner. There is so much to learn. Thank you for sharing your lovely work with us. 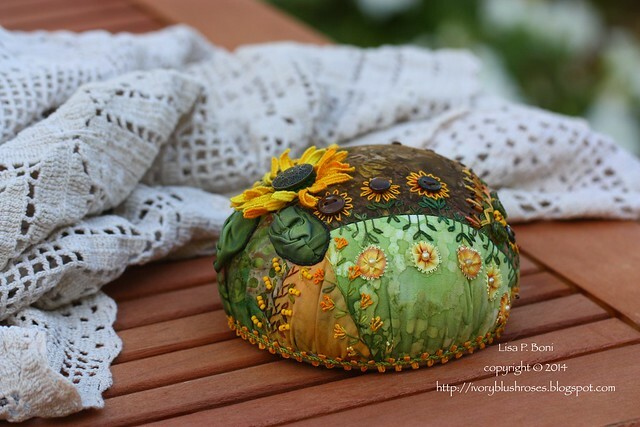 This sunflower pincushion is, as all he others are, spectacular. I am in awe of your work. I can strive all I want, but I could never be this good in my lifetime. But, you certainly do inspire me to do better. Thank you for all you contribute to the beauty that I see in this medium. This fits for Sept/Oct as well as August. The colors are perfect and this cushion is specacular! !